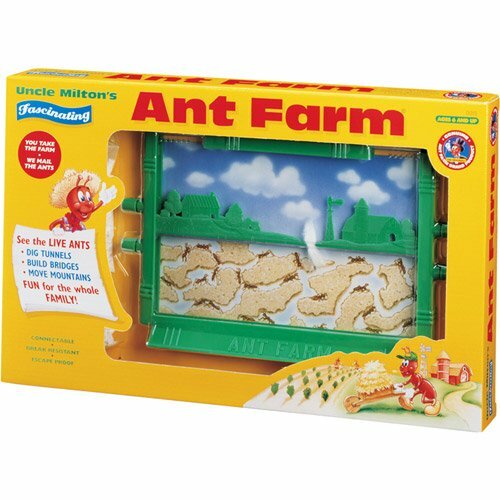 The Uncle Milton Ant Farm lets your child observe the underground world of ants. This classic kids' ant farm lets your child see ants interacting and digging tunnels. It is break-resistant, escape-proof and comes with clean sand. It has four ant ports that can be connected to other ant habitats. This sand ant farm is designed for children 6 years old and up. Product Dimensions: 10" x 1.5" x 6"
Uncle Milton Sand Ant Farm. Watch the world's tiniest engineers dig tunnels, build roads, and erect bridges. See them plan and construct highways and subways - moving mountains right before your eyes! It's a fascinating peek into the secret world of ants. Uncle Milton's Fascinating Ant Farm features: Four Antports for connecting to other Ant Farm brand ant habitats, antway Connector Tubing, tip-proof stand, clean tunneling sand, illustrated Ant Watcher's Manual, break-resistant and escape-proof. Perfect for classrooms! Includes order form to receive live ants by mail* Ages 6 and up Adult assistance recommended.